Pirates lefty Felipe Rivero will henceforth be known as Felipe Vázquez after undergoing a legal name change, Elizabeth Bloom of the Pittsburgh Post-Gazette reports. That modification will be reflected on the back of his uniform in short order. You’ll need to read the article for the back story, but the new surname will match that of the southpaw’s sister, Prescilla Vázquez. The siblings are very close; she is said to have played a notable role in advising her brother on his agency decisions and working out the long-term deal that he signed over the winter. As the Bucs order up some new jerseys, they’ll hope that the newly renamed Vázquez can maintain the form he showed last year as Rivero. In 75 1/3 innings, the power lefty allowed just 14 earned runs on 47 hits while compiling an 88:20 K/BB ratio. He also racked up 21 saves after moving into the closer’s role. That performance led to a four-year extension in January. The deal promises Vázquez $22MM for the 2018 through 2021 seasons and also leaves the club with two option years. While Kaufman acknowledges that there’s almost zero chance the petition could ever actually prompt Nutting to sell the team, the 43-year-old Kaufman believes the petition is to show the front office that there’s a collective anger towards the front office. He even goes so far as to compare the McCutchen trade to a “death in the family,” saying that the five-time All-Star’s value isn’t just about how he performs on the field, but what he does for the community. Elizabeth Bloom of the Pittsburgh Post-Gazette offers some insightful quotes from Pirates closer Felipe Rivero in regards to his recent extension. He signed the contract at least in part for his level of comfort in the clubhouse and his interest in being relaxed for the next few years. In the reliever’s own words, “It’s not about the money.” Apparently, his sister Prescilla was heavily involved in the negotiations, reportedly even more so than his agent. And it’s perhaps worth mentioning that the McCutchen and Cole trades did not have any effect on the negotiations between he and the Bucs. Rivero came to the Pirates in July of 2016 as part of the return for Mark Melancon. Last season, the left-hander turned in a 1.67 ERA and a 3.03 xFIP. He collected 21 saves following his takeover of Pittsburgh’s closer role in June. In a late response to Josh Harrison’s comments revealing a desire to be traded, Pirates GM Neal Huntington expressed that he wants the team to win “sooner than later” (via Adam Berry of MLB.com). “We love Josh’s passion, love the fire and what he’s done for this team and this organization,” Huntington said. “We want what’s best for this organization.” Yet although he attempts to differentiate the team’s moves from a rebuild, it’s interesting that he describes the 2018 club as “a group of players that’s going to show up every day to defy the odds.” It’s hard to imagine that these comments will ease Harrison’s mind about the Pirates’ ability to compete in the coming season. The 30-year-old infielder can be controlled through the 2020 season. Jon Heyman of FanRag Sports offers a defense of the Pirates’ blockbuster trades, offering some praise for Joe Musgrove, Colin Moran, Kyle Crick and Bryan Reynolds. In discussing Moran’s value, Heyman adds that he was slated to be a key piece in a trade for Zach Britton before the Orioles cancelled the deal. However, it seems as though the Bucs could have landed a better return for McCutchen had they traded him last offseason, as they reportedly had an offer from the Nationals that included Gio Gonzalez and Lucas Giolito. Jung Ho Kang is making another push to return to MLB, Sung Min Kim of Sporting News tweets. The former Pirates infielder has allegedly arrived in the Dominican Republic in order to apply for a work visa. Kang last played in the majors in 2016, when he collected 21 homers in 370 plate appearances while posting a .255/.354/.513 slash line while playing third base for the Bucs. Speaking with Bill Brink of the Pittsburgh Post-Gazette and other reporters on Saturday, the Pirates’ Neal Huntington didn’t sound like a general manager who expects center fielder Andrew McCutchen to remain in the fold for the long haul. Although Huntington said the Pirates “would love” for the 31-year-old McCutchen to be a careerlong member of the organization, he noted that keeping the five-time All-Star and trying to win championships “are contradictory goals” at times for the small-market club. With the Winter Meetings set to begin, we’re approaching a year since the Pirates nearly traded McCutchen to the Nationals at the 2016 festivities. McCutchen ultimately stayed with the Pirates, of course, and enjoyed a bounce-back year at the plate. Since last season ended, the Giants have shown reported interest in acquiring McCutchen, who has been a member of the Pittsburgh organization since it selected him 11th overall in the 2005 draft. While Huntington said that getting infielder Jung Ho Kang back in 2018 “would be huge,” the Pirates don’t expect it to happen (via Rob Biertempfel of the Pittsburgh Tribune-Review). Kang still hasn’t secured a work visa to return to the United States since he received his third drunk driving conviction in his native South Korea last offseason, thus forcing him to sit out the 2017 campaign. During his most recent game action, Kang struggled so mightily as a member of Aguilas Cibaenas of the Dominic Winter League that the club released him last month. Speculatively, Kang’s status could affect the Bucs’ offseason plans, though in-house options David Freese, Josh Harrison, Jordy Mercer and Sean Rodriguez bring plenty of experience at one or both of his positions (third base, shortstop). Closer Felipe Rivero is coming off his first full year in Pittsburgh, during which he was among the premier relievers in the game. Now entering his first of four arbitration-eligible years, Rivero is already under Bucs control for the foreseeable future, but he’s open to signing an extension with the club (per Elizabeth Bloom of the Post-Gazette). “I wanna stay here for a little bit,” Rivero said. “It’s a good city to stay. Clean, very good people. So that’s the main reason. You know, I feel comfortable being here, so I want to be here a couple of years.” The 26-year-old Rivero’s agent will meet with the Pirates on Monday, Bloom reports. Interestingly, Rivero revealed that it was his sister’s advice to change representation earlier this offseason. Rivero’s now a Magnus Sports client, and he had been in touch with the agency for roughly a year before its hiring. The Pirates have made a host of changes to their scouting and front office staff, Bill Brink of the Pittsburg Post-Gazette reports. Steve Williams, a major league scout since 1988, will be their new director of pro scouting. Junior Vizcaino, formerly of the Red Sox, will replace the recently-discharged Rene Gayo as Pittsburgh’s director of Latin America scouting. Assistant GM Greg Smith will now work under the title “Special Assistant to the GM”, though it’s not quite clear what the change in his role will actually be. Pitching coordinator Justin Meccage will now join the coaching staff as assistant pitching coach. In addition, pro scout Sean McNally has been named Special Assistant to the GM, John Birbeck and Matt Taylor have been made scouting assistants, and Joe Douglas and Justin Newman have been named quantitative analysts. While these moves seem to be mostly routine shuffling, it’s worth noting that very few first-round picks of the Pirates have lived up to their billing over the past 12 years. In other Pirates news, closer Felipe Rivero has dropped agent Scott Boras. He’ll now be represented by Magnus Sports, according to Elizabeth Bloom of the Pittsburgh Post-Gazette. Rivero enjoyed a breakout season in 2017, posting a 1.67 ERA and 3.50 WPA across 75 1/3 innings thanks in part to a 10.51 K/9 and a 52.9% ground ball rate. Although he enjoyed a bit of BABIP and home run luck, his 3.03 xFIP is still a solid mark. The left-hander compiled 21 saves after taking over as Pittsburgh’s closer halfway through the season, and is arbitration-eligible for the first time next offseason. He should be in line for a significant raise if he can perform close to his 2017 numbers. Bloom notes that Magnus Sports also represents some other closers, including Aroldis Chapman of the Yankees and Raisel Iglesias of the Reds. Speaking of Iglesias, the right-hander has officially decided not to opt into arbitration, according to Mark Sheldon of MLB.com. It seemed highly unlikely that Iglesias would choose to do so this season, considering his contract will pay him $4.5MM next season, while MLBTR’s arbitration model projected him for a $2.8MM salary. Nevertheless, Iglesias’ statement ends any speculation that he would opt into the process during this offseason (though he’ll have another opportunity next year). For the 2017 season, Iglesias finished 15th among relievers in total innings pitched (75), 22nd in ERA (2.49), 13th in saves (28), and tied for 13th in strikeouts (92). Right-hander Chris Leroux, who played 41 of his 65 career MLB games in a Pirates uniform, is moving into a very different endeavo(u)r as the new star of The Bachelor Canada. Leroux, 33, posted a 6.03 ERA over 71 2/3 career innings in the bigs from 2009-14, pitching for the Marlins and Yankees as well as the Bucs. The Montreal native pitched for Canada in this year’s World Baseball Classic before announcing his retirement in March. The Pirates announced to reporters today that they’ve pulling left-hander Tony Watson from the closer’s role (Twitter link via Stephen J. Nesbitt of the Pittsburgh Post-Gazette). For the time being, Pittsburgh will rely on a combination of left-hander Felipe Rivero and right-hander Juan Nicasio in save situations. Both throw considerably harder than Watson and both have enjoyed a markedly better season than Watson, who has limped to a 4.44 ERA with 6.8 K/9, 2.7 BB/9 and a 41.4% ground-ball rate. Watson has been charged with two earned runs in four of his past seven appearances, and those struggles prompted the shift. 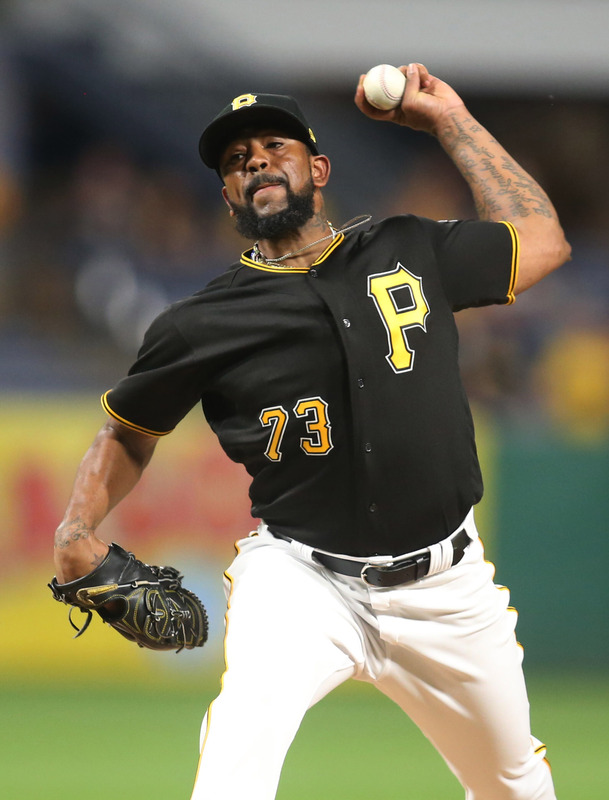 The 32-year-old is a prime trade candidate, though his recent slump and deteriorating peripherals mean he’ll likely need a quick rebound if the Pirates are to receive much of value in exchange for their longtime reliever. To keep tabs on the ninth-inning situation for the Pirates and the other 29 teams, be sure to follow MLBTR’s affiliate Twitter site, @CloserNews. Speaking of Rivero, his new part-time closer, Hurdle said that Huntington was “steadfast in wanting Rivero included…from the start” in the trade that brought the southpaw to Pittsburgh from the Nationals last year in exchange for Mark Melancon. After two good seasons, Rivero has been flat-out dominant this season, posting an 0.58 ERA, 9.9 K/9 and 5.67 K/BB rate over 31 innings. Pirates reliever Felipe Rivero has changed his representation, according to Jon Heyman of Fan Rag. Rivero has hired the Boras Corporation, per the report. Rivero, who will turn 26 this summer, can’t qualify for free agency until 2022. But he entered the season with 1.162 days of service, so he’s nearly certain to qualify for arbitration at year’s end as a Super Two player. The Bucs will end up paying Rivero at a healthy rate, as he’s currently carrying an outstanding 0.73 ERA with 9.9 K/9 and 1.8 BB/9 over 24 2/3 innings. That payday could increase qutie a bit more if Rivero ends up ascending to the team’s closer role — as has been speculated as a strong possibility if the team deals incumbent ninth-inning man Tony Watson at the deadline. Pittsburgh has to like what it has seen thus far. The club acquired him when it shopped closer Mark Melancon last summer, making a calculated gamble that the young southpaw would continue to progress and make good on his obvious talent. Taking a major-league reliever also meant foregoing the possibility of a prospect-driven return for the veteran Melancon, but that seems a wise choice at this juncture. Pirates closer Tony Watson has changed agencies and is now a client of Scott Boras, reports Jon Heyman of FanRag Sports. The soon-to-be 32-year-old lefty will be a free agent following the 2017 campaign. Watson stepped into the ninth-inning spotlight for the Pirates last season following their trade of Mark Melancon to the Nationals, and he’s racked up 23 saves since that time. He’s posted a 1.62 ERA through his first 16 2/3 innings this season with a career-best 50 percent ground-ball rate, though it’s also worth noting that there are some potential signs for concern. Watson’s velocity is down this year (though his 92.4 mph average fastball still has plenty of life for a lefty), and he’s also seen his K/9 and BB/9 rates trend in the wrong direction. Those red flags notwithstanding, Watson has been among baseball’s most durable pitchers — he’s third in the Majors in appearances since 2014 — and left-handed relief help is always in demand near the trade deadline. Pittsburgh showed last season that it wasn’t afraid to deal Melancon even with a Wild Card spot still in reach, so even if the Bucs right the ship, Watson will be a similarly likely trade candidate this summer. The Pirates, after all, won’t be making a qualifying offer to the lefty, so they would stand to lose him for no compensation at season’s end if he’s not dealt this summer. Heyman notes that the Pirates view hard-throwing lefty Felipe Rivero (acquired in the aforementioned Melancon deal) as their closer of the future. It’s obviously still quite early to be putting forth a firm contract estimate on an impending free agent, but a typical Watson season — he pitched to a 2.22 ERA with 7.9 K/9 against 2.0 BB/9 from 2013-16 — would put the southpaw in line to cash in on a three- or four-year deal this coming winter. Watson adds to a Boras free agent class that includes the likes of Jake Arrieta, Eric Hosmer, Mike Moustakas, Carlos Gonzalez and Jeremy Hellickson (among others). His switch is now reflected in MLBTR’s Agency Database, which contains agent info on more than 2,500 Major League and Minor League players. If you see any notable errors or omissions within, please let us know via email: mlbtrdatabase@gmail.com.